Wisdom teeth usually appear in adulthood and are the last teeth to push through the gums. 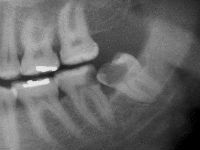 Also called “third molars”, most people have 4 wisdom teeth, although some people have none. A common issue that affects many people is the lack of space at the rear of the jaw for the wisdom tooth to come through, resulting in a tooth that is trapped behind the second molar teeth, becoming impacted. removal of the tooth is recommended. The length of time needed to treat and remove a wisdom tooth depends on how badly it is impacted and whether or not there is any infection or cysts around the tooth. If you have a severe infection, you may require some treatment to resolve the infection before your tooth can be surgically removed. The removal of four wisdom teeth generally takes 30 minutes. The removal of impacted wisdom teeth is performed under anaesthetic. If the removal is relatively simple and straightforward, you may only require a local anaesthetic. For more complex removals, or if you are excessively nervous about the procedure, we may recommend a general anaesthetic where you will sleep throughout the surgery. After surgery, you may experience some pain, bleeding and swelling. We will prescribe pain relief for you, and we’ll also send you home with a care pack that includes post surgery instructions and sterile cotton gauze. To control any bleeding, place the cotton gauze over the area and bite down gently but firmly. The pressure will stop the bleeding. Any swelling should disappear within four or five days.